It is imperative that avid Bossons collectors take notice and help alleviate copyright infringements, unauthorized colorings, and fraudulent copies confronting the Bossons collecting world today. If we truly care about these original art forms, created for our enjoyment and lasting value, a constant vigilance is necessary. As we know, the late William Henry Bossons founded Bossons in 1946. When he died in 1951, his son, W. Ray Bossons took charge as Director. In 1958, Ray oversaw the designing of our first “Character Wall Masks.” Like his father, he made certain standards were maintained and the authenticity of the Bossons creations were not only of the highest quality but protected against unauthorized paintings and copies. Personally, I witnessed Ray Bossons determination to eliminate any illegal copies of Bossons. I saw hundreds of chalk copies of military masks, Series B heads, and many of the wildlife Bossons stored in apple boxes under the counters at a Ceramics Shop in Alamogordo, New Mexico. We speculated that Bossons were replicated from those sold in the PX’s at Holloman Air Base and White Sands Missile Range. I wrote Ray about the copies. He immediately sent the following letter to the Shop owners in Alamogordo. We are the creators of original copyrighted Artware, particularly character wall heads, and we understand that your company is currently selling items that are copies of our models. Your sale of these copies constitutes copyright infringement and unfair competition. In order to avoid litigation in this matter, we must have your immediate written assurances that all sales of such copies will cease forthwith. We trust that this matter will be amicably settled. However, if we do not receive your assurances that sales of these infringing copies have ceased, we shall be obligated to take legal action to seek both damages and injunctive relief. RE: The Ceramics Shop, Alamogordo, New Mexico, USA Dear Mr. Bossons: I have been requested to review your letter to the Alamogordo Ceramic shop and the enclosed information entitled “Character Wall Heads.” The owner also wishes to avoid any litigation in this matter. Without making a disclosure or admission as to any infringement, they will discontinue use of any reproductions that may raise questions of copyright infringement. Should you have questions in regard to this matter, please feel free to contact me. Very truly yours, R.R.B.. Attorney at Law"
We visited the Shop a couple weeks later and noticed that all the apple boxes with their plaster contents had disappeared. Further, I have more examples where Ray took other dealers to court and won suits against them. He was determined to protect Bossons from the illegal pirating of our collectibles. (Soon after this incident this same ceramics dealer went out of business). Ray Bossons retired in 1994 and died in May 1999. We are now left with a monumental problem of policing the industries and markets on our own. Jane Roberts Bossons, his daughter, and attorney, directed the operations until closing in December 1996. Now individuals who are avid collectors and honest dealers throughout the world must help. The International Bossons Collectors Society(IBCS) has been entrusted with the responsibility of taking a lead in dealing with these kinds of problems. Through direct verbal and written communications with Ken Potts, Factory Foreman and principal Moldmaker at Bossons over the years, it was consoling to know that under the direction of Jane Bossons, Ken assured me that the original molds he had stored under lock and key would never be copied or sold. As recently as 2009, I discussed the problem with Richard Bossons, Ray's Son, who indicated a great concern in protecting the integrity of original and authentic Bossons as true works of art throughout the world. In Ray’s later years, Ken was one of the only life-long and trusted confidants who visited Ray’s side. We can all unite in our efforts to maintain the integrity of Bossons throughout the collecting world. 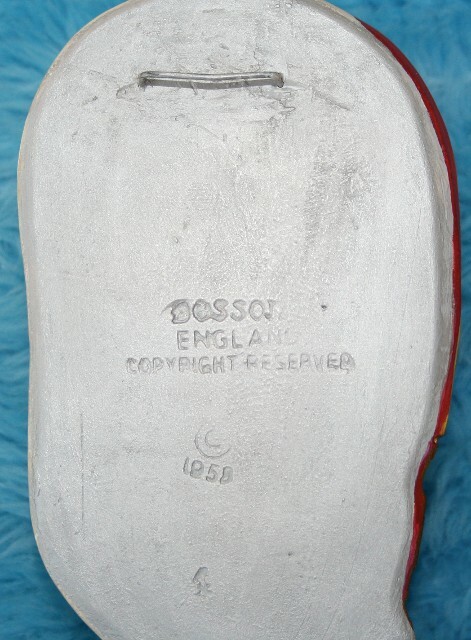 “…Bossons are no longer produced, and as such are becoming very collectible. Unfortunately, unauthorized paintings and fraudulent moldings are circulating throughout the secondary markets worldwide, especially on the Internet. We have tangible evidence of illegal copies of all categories of Bossons being made and distributed from other countries. (This author presented an extensive and documented iMovie lecture at the 2003 Annual Meeting of the IBCS concentrating on the numerous copies of Bossons that were being illegally copied and poorly painted and freely sold on the Internet.) Character Masks of Caspian Woman, Gilded Winston Churchill, and Harry Wheatcroft; Wildlife including Squirrel, Raccoon and Chipmunks; and Dogs of Distinction, e.g., Bassett Hound and Alsatian were sold by individuals and dealers on eBay. But these discussions are not enough to prevent the continued proliferation of the frauds. Being fully aware that unauthorized paintings and fraudulent moldings are circulating throughout the secondary markets, we can excuse the innocent, who lack the background and experience in recognizing the fakes; however, it is especially serious when well-known collectors are seen buying these products on eBay. We encourage all to make every possible effort to avoid buying these fake Bossons. One of the best approaches is to write these sellers in diplomatic and positive terms encouraging them to join us in eliminating fraudulent and inferior Bossons products from the Internet. Very often the sellers are not well informed about Bossons and are usually happy to cooperate. Here is a sample of one recent experience that can serve as an example of how one can solicit cooperation through ‘helpful’ comments. “I trust you are aware these figures are fraudulent copies of our Military Masks from Bossons. I did reply to assure the seller that I realized they were not acquainted with Bossons. I also provided her with a descriptive analysis of quality Bossons,. and offered to send photos for further clarification. This is only one example of hundreds of emails and letters I have written just in the past year. We all must do the same. You will find a small minority of responses to your emails will be negative, and that is to be expected. However, continue to be positive and instructive. Finally, if you are buying on eBay, and have any doubt about the authenticity and fail to get ADVANCE advice and assistance, I recommend very strongly that you NOT purchase the item. Quite often, after the fact, in email from uninformed collectors, there are questions as to whether they have purchased an original or a ‘knockoff.’ We can help you at Don's Collectibles. One of the most frequent examples of fakes being sold on eBay is with the CASPIAN WOMAN with and without veil. Below you will see two fraudulent colorings of the Caspian Woman that were up for sale on eBay. But first, see pictures of my original Caspian Woman followed by the two appalling examples that appeared on eBay. There are dozens of fraud examples of many different Bossons on the Internet every day. 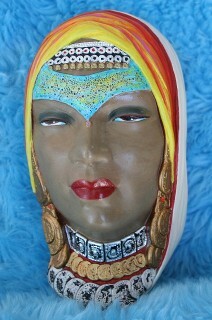 Don’s original Caspian Woman (copyright 1958). It came directly from Bossons in the 1980's. As you compare, notice the sharp detail in the blue veil; the gold and silver coins backed with magenta; and the impeccable details in the multi-colored contrasting depth of ivory, blues, and pinks in the outer headpiece. In particular, see the beauty of the semi-glossed face of light brown-raw sienna, and the pink, and gray colors with highlights around the eyes, mouth, and nose. With heavy shadows and sky blue coloring, the eyes appear to be almost seductive. 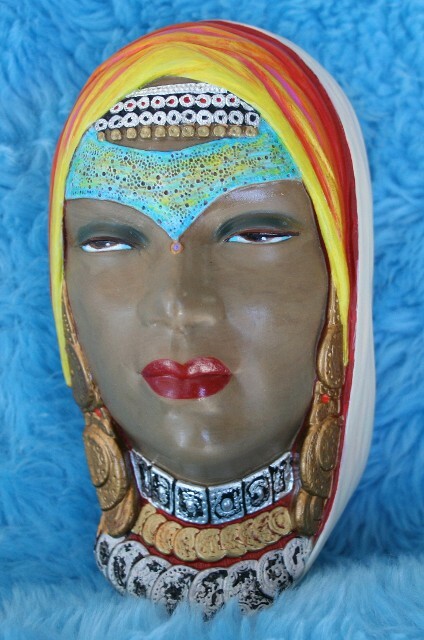 Supplementary pictures of Don’s original Caspian Woman without veil showing the side view that pictures a three-dimensional multiple coloring of the Caspian Woman's shawl. 1958 incised copyright and external wire hanger. The outside wire hanger is the FIRST TYPE used BEFORE Bossons began using a ring-hook attached to an embedded wire. Then followed the metal rod that was recessed into a small rectangular opening in the plaster. Both of these eBay auctions were being sold from the U.K. These terrible examples above could be called “Miss Chocolate Caspian,” and the other “Miss Orange Caspian Woman.” I wrote both sellers asking them to kindly close the auctions and that they were not authentic and were illegal colorings of the original Caspian Woman from Bossons (1958-59). Importantly, the backs of these figures were not shown on the auctions. Seeing the backs always helps serious collectors determine if the item is a "fake copy or an authentic Bossons. WE solicit YOUR COOPERATION IN NOT PERPETUATING THE DISTRIBUTION OF INFERIOR QUALITY BOSSONS. Collect authentic works of art and encourage others to join together in keeping the Bossons world free of fraudulent imposters creeping their way into the ‘Magical’ World of Bossons.